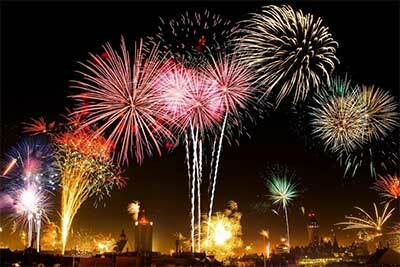 Welcome to the June 2013 Edition of the HamSphere Newsletter! Summer is here in the Northern hemisphere and it is a good time to make a DX Expedition or bring your handheld on your vacation. With the ever-growing Internet you can bring HamSphere almost anywhere. We are now available on the PC as well as Android and iPhone. We have a lot of stuff lined up for you, so here we go! "Independence Day, commonly known as the Fourth of July, is a federal holiday in the United States commemorating the adoption of the Declaration of Independence on July 4, 1776, declaring independence from the Kingdom of Great Britain. Independence Day is the National Day of the United States"
Three years ago we arranged the first 4th of July contest and this year we will hold the contest on the 10, 15 and 20 meter band. This contest will be a 24 hour contest between 06.00 UTC 4th July to 06.00 UTC 5th of July and with 1 point per QSO. Work each station once per band and get maximum 3 multipliers for all 3 bands and station. Father's Day in 2013 is on Sunday, the 16th of June and HamSphere celebrates this with a 24 hour Fox Hunt. The winners will as usual receive extensions on their subscriptions. Foxes are ID’d by: MOE, MOI, MOS, MOH and MO5. They all transmit with slow Morse code with 100 milliwatts so they can be difficult to spot if propagation is low. This particular hunt will be carried out Sunday 16th June 2013 00.00 UTC until 23:59 UTC and the objective is to log as many foxes as possible. 5 Winners will be rewarded free subscription extensions. The hunt was on from March 29th to April 8th. 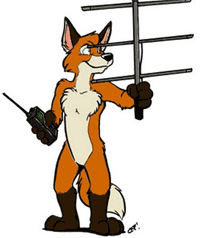 We hid a little over 50,000 Foxes. .
We have launched a new project called "Xpeditions" with its goal to enhance the DX activity on HamSphere. An avid DXer Santos, CT2EHF, runs the project. HamSphere has for a long time received requests for Island activations and Santos CT2EHF brought the concept up and presented a few ideas that we liked and supported. HamSphere will not endorse, support or sponsor any other special activation call signs than the prefixes we assign for DX-Expeditions so please do not ask for special call signs for special events. Our authorized "Xpedition" call signs will be very specific. 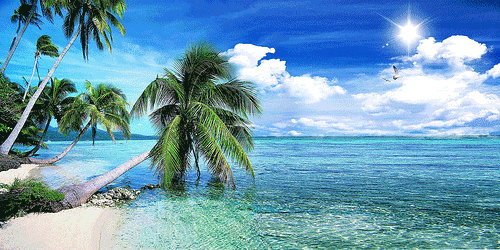 We are starting out with the IOTA (Trademark of RSGB) "Island On The Air" concept. We will call this IOHS = Islands on HamSphere. Later on we may extend these DX-Expeditions to cover Lighthouses, Castles or other exciting fixed landmarks. When it comes to awards we are still contemplating this. HamSphere's official line is to be very careful when it comes to issuing awards. We will discuss this with the DX-managers. But as of yet we do not have any official info on the Awards in regards to DX-Expeditions - it is something that will come later. Manager and Moderator for this forum is Santos CT2EHF. 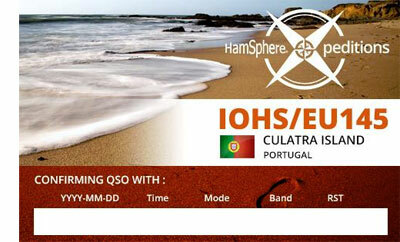 HamSphere will start recognizing DXCC entities in the HamSphere 4.0 as of next year. DXCC or the "DX Century Club" is an award issued by the ARRL. It has a list of 340 entities (Countries and Locations). HamSphere's equivalent of DXCC is "DXHC" and we will extend our DXHC list from using ISO2 codes to recognize all 340 entities. As a preparation we have added a DXHC field to all accounts. We will be determining your DXHC code by looking at the ISO2 code + IP Region code. The ISO2 code is a 2 digit alphabetic code representing your country. You will be able to see your DXHC code in your profile once it has been established. If you for some reason which to change your DXHC code you can use our Support board and ask for a change. HS Operators do not have to change their call sign to reflect the new DXHC entities, however, they may if they wish change the HS prefix i.e. from 26HS to 108HS etc. But have in mind that once you change your call sign you will have to start with a new log book and new QSL cards. Such changes can be ordered from our Support board. Call signs on Ham Radio are never interchangeable and each call sign has its own entity and logbook. Bronze - Master awards will be extended with a new award for 200 DXHC countries and above. We are currently working on an African and Asian Award, which will be presented soon. We have re-activated the DX Alert system. It was closed down for maintenance some time ago. You can set the system to watch for any DX that you have been looking for. 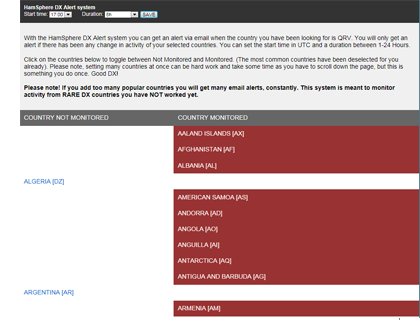 The system will alert you via email if and when there is activity from that country. You will find the DX Alert system in the main menu of the HamSphere website once you have logged in. Here is a crude outline of the upcoming HamSphere 4.0 module repository and it’s principles. HamSphere 4.0 modular rig is under development and will be tested during Q4 2013 with a beta launch Q2/Q3 2014. The operator will be able to build his own rig by dragging and dropping modules to the radio from the repository. There will be a variety of skins to select from. The new HamSphere API will be launched for beta in Q4 this year. The API allows the developer total control over the HamSphere Master Bus (HMB). In this example below we can see a "plugin" FIR filter that taps in to the bus and sends the audio to the mixer and finally to the speakers. The developer will have full control over all audio and control functions in the system, tapping in and out from the HMB. 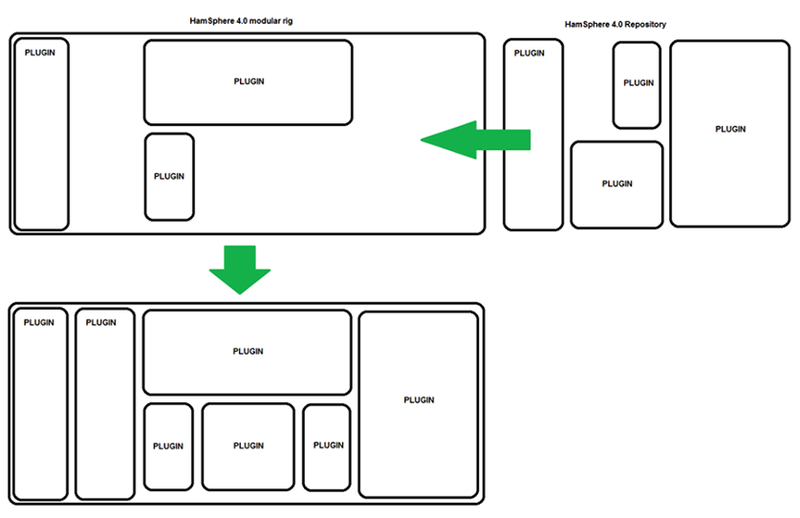 This opens endless opportunities for developers to write modular plugin modules. The developer gets access to basically all functions including screen output, which even makes it possible to make SSTV or Video plugins etc. Licensed HamSphere plugin developers will be able to market and sell their plugins on the "HamSphere Plugin Market/Shop" with a commission. The API will be totally free and modules are written in the Java language. We are currently extracting the different modules from HamSphere 3.0 and will offer the basic Transceiver including a standard set of plugins. How often must I identify? This is a great blog post from KB4T - Frank. Too many HamSphere operators OVER-IDENTIFY. It simply isn’t necessary to identify yourself at the beginning and end of every single transmission. Identifying too much is a poor operator practice. Identifying too much is a waste of time and, for some, annoying. 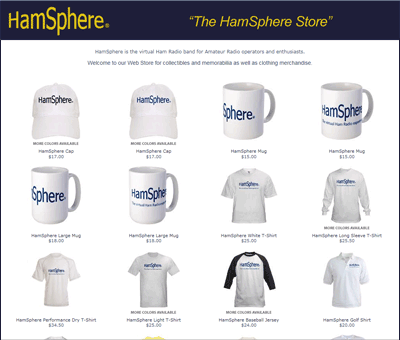 HamSphere is a privately owned Internet entity. It is a simulation of the real ham radio world. No governmental regulatory body dictates how HS operators shall identify. There are no published rules in the HamSphere Manual about how often you must identify. Thus, common sense is the guiding policy here. a) When you start a conversation, when you end a conversation and every 5 to 10 minutes during the conversation. b) When you want to clearly indicate which operator in a roundtable conversation is to speak next. Did you know that you almost NEVER have to identify the other party or parties in the conversation during most of the chat? Some operators feel compelled to identify when they start every transmission and again when they end the transmission. This is simply not necessary. During a conversation it simply isn’t necessary to identify the other operator(s) in the conversation. You only need to identify yourself. There is a peculiar practice being used on HamSphere that defies logic and is definitely not typical Ham Radio practice. Some operators will give their callsign followed by “responding to” and then the callsign of the party to whom they are speaking. This is confusing and contrary to typical ham radio practice. In the United States and many English-speaking nations, recommended practice when fully identifying both stations is to always give the other party’s callsign first followed by “This is” and then your callsign. It’s always best to give the other party’s callsign first, then yours. Consistent, sensible, logical, standard operating practices are the hallmark of a top notch operator. Identify yourself when it makes sense to do so. Avoid over-identifying. Give the other operator’s callsign only when it’s necessary to do so. Set a good example for others and especially the newcomers to HamSphere by using standard, sensible identifying practices. Hello, I am 2HS1637 Ed from New Jersey, USA. I found HamSphere some 3 1/2 years ago. I must tell you, I have enjoyed every contact I have made and have made a lot of good friends on HamSphere like, 29HS132 Tony, Paul 2HS3433, N8ZZF Pat, OZ1HLT Henrik, 13HS575 Geert and 2HS4759 Mike, just to name a few. I can be found on 6 meters most day’s. 73 for now see you on HamSphere. 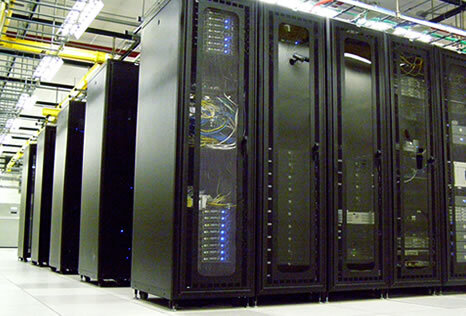 HamSphere has upgraded the server hardware using only 8 core Intel machines + 8 Gig memory. The latest addition is in Cologne, Germany. We have also upgraded the overall speed between all servers in the network. We have done these upgrades to enhance the performance and reduce the latency. Did you know that you can tell your friends about HamSphere and get bonus subscription days? For each friend that signs up you get between 10-15 days extra bonus on your subscription. So tell all your friends about HamSphere via this link.